SAVING FORTHE FUTURE: Seed store owner Jere Gettle and his wife have traveled the world collecting rare and exotic seeds, as well as the more homely ones found in area fields. That we are in the midst of the Great Recession, as UC Berkeley economist Robert Reich has named it, is now a given. Whether we weather this storm with discomfort but without a real tempest breaking loose economically is anybody's guess. Either way, it seems a wise time to look to a deeper level of security for family and close friends, including food security, and the time has never been better to bring a seed bank to town. The Baker Creek Seed Co., taking up new residence in Petaluma, offers an amazing variety of ways to grow. Hard times create a longing for what is perceived to be a simpler, sweeter time, the foggy past recalled through the lens, perhaps, of Laura Ingalls Wilder. Interesting that Wilder wrote her stories of honest, hard-working farming families a mere 10 miles down the road from where the original Baker Creek came into being in the midst of the Missouri Ozarks. Baker Creek stocks some 1,578 separate varieties of organic and heirloom seeds, all set out in bins about chest-high in Petaluma's majestic former Sonoma County Bank building. The company claims to be simply "the largest source of heirloom seeds" in California. The seed bank not only stocks fruits and veggies, but also actively seeks and stores rare seeds whether or not a profit is likely. Some have suggested that as a storehouse for endangered seed, Baker Creek is really a service organization, ripe for nonprofit status, but for the foreseeable future, the seed business is coming along fine without protection of a 501c3. Since 2003, Baker Creek has published a full-color magazine, The Heirloom Gardener, with the slogan "The no-ads, no-fluff, all-dirt magazine" matching its in-depth articles on various aspects of gardening and the little-known vocation of "seedsman," an endeavor coveted by owner-founder Jere Gettle since he was a small child planting seeds alongside his grandparents in their Missouri orchards. "I always hoped I wouldn't have to take up another kind of work other than gardening," says Gettle. He never did. 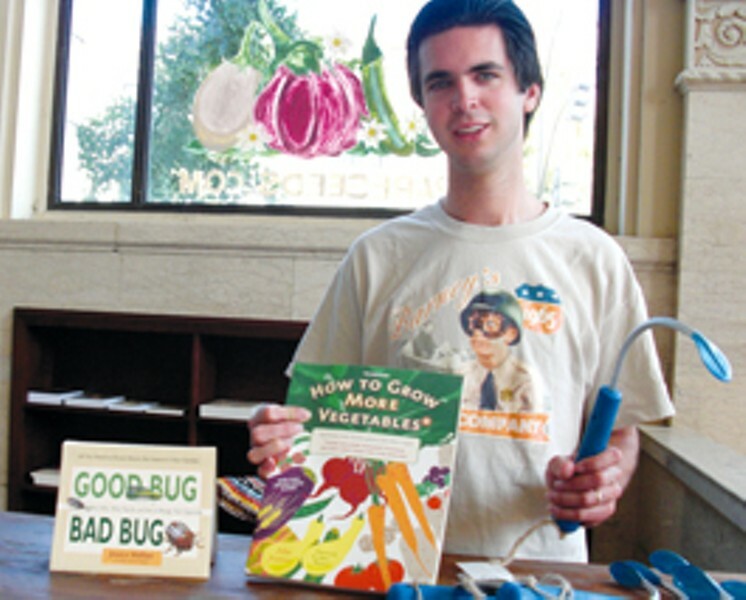 Gettle is very partial to vegetables and became a vegetarian on his own volition at age 12, publishing his first seed catalogue at age 17. Gettle, a still young entrepreneur at 28, made his career choice public by starting up Baker Creek, named after a creek that runs alongside his family's land. The inside of Baker Creek essentially houses a miniature theme park called Bakersville Pioneer Village, which reflects a real place in Missouri that celebrates old-fashioned ways in pharmaceuticals, retail, music, baking, seeds and more and houses Gettle's main store. Gettle, his wife, Emilee, and their one-and-a-half-year-old vegetarian daughter, Sasha, have traveled around the globe to seek seeds. The couple even went to Thailand and Japan, and plan to explore the Middle East when Sasha is a bit older. A team of Amish workmen who have worked with the Gettles in Missouri facilitated the move into the immense Petaluma building. The Amish crew was flown in from their farmland near Bakersville. "These men are the hardest workers I've ever known," Gettle says. The Amish drew attention to the project wearing their traditional flat straw hats and suspenders during construction of the store, and their presence was noted with enthusiasm by locals and tourists alike. Sonoma County is awfully far from Missouri. Why here? "We needed to have a place to store some seeds that doesn't freeze in the winter," Gettle explains. "Some of these seeds would be endangered by the winters in Missouri." Ironic that Baker Creek has moved to Sonoma just as the Marin-based Smith & Hawken is closing its doors. Yet the reason people came to Smith & Hawken at first is even stronger in 2009 than in 1984 when that company began. People want a great garden more than ever, whether to best the Joneses next door or because they take dire peak-oil predictions to heart and are serious about self-sufficiency. Popular lecturer, radio host and author Caroline Casey likened gardening to some sort of new age heroism at the recent Harmony Festival in Santa Rosa, calling on the crowd to "compost" every evil thing on the planet. "Let's take all the chi out of it!" she said, referring to war and social injustice in all their forms. Gettle may not care about chi, but he does care about the land, describing his business in a recent interview as an effort to "swim against the river of modern agriculture as we continue to work for the farmer, the gardener and, most of all, each and every eater."